- these predators function so well because there is no counter-narrative. contribution and progress, maybe has something to do with this. quality at the end of the day. subject to blackmail or pressure such as Beall may have been. > predators, and we should do all we can to stop this practice. > the community, and we should all be watch dogs. > The list your refer to the Bealls List? > methods and results  (hey, what's more Open Science than that !). > would have a source to refer to. > lists in an authoritative way  ? > Stellenbosch University, South Africa. > important for academic careers – you don’t get ahead if you don’t publish. > publish three papers rather than do a dissertation. > potential, possible or probable predatory scholarly open-access publishers. 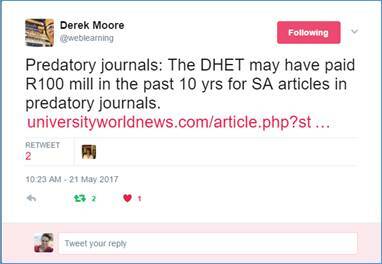 > the past 10 years for articles that appeared in predatory journals.